Location: 300 meters from the Taiwan Yushan National Park range. This tea area is located amongst the conifer forests. The cool temperate mountain is shrouded in mist. This mist keeps the humidity high and reduces the time the tea trees have under the sun. This area has a very low tea yield because of its location. Features: The fragrance of the tea gardens among the forests is fresh air like no other. The high mountain air mixed in with the tea gives a crisp preview to what your cup of tea may taste like. Our tea is hand harvested and processed. This ensures complete control and care over every leaf. To stop oxidation, the leaves are heated in the tumbling machines. After the leaves come out of the tumbler, they are ready to be rolled and dried. The leaves get passed through the drying machine. Like a giant toaster oven, the leaves move slowly along a conveyer belt under consistent heat. After the first pass through the drying machine, the leaves are then shaped by kneading and twisting. The leaves then get rolled into balls of cloth, which compresses the leaves and helps to maintain the balled oolong shape. Ball shaped oolong leaves, ready to be steeped and enjoyed. Aroma: the traditional process can bring out many unique notes from within the leaf. A complex range of juniper wood, dark wood, or sweet fruity floral orchids can be detected. Fig A: 160cc Glass Gaiwan容器 Fig B:第一次出湯茶樣 The leaves after the first steeping. How to enjoy tea making! The leaves after steeping overnight for more than 13 hours. The dry tea leaves do not need to be refrigerated to maintain its fresh flavor. Simply store in a cool, dry, airtight place. Do not refrigerate! The tea she is enjoying in this picture is a cold-brew, made the night before. Do you want to enjoy the taste of Jade Mountain tea with us? Yâng Hú (養壺) in Chinese literally means “nourish pot” and refers to how one cares for their teapot. The most sought after teapots are traditionally made by artists in Yi Xing, China (宜興). The clay from Yi Xing is also considered to be the best quality and is used by famous artists in Taiwan. The skill that goes into hand-making these pots is enormous, and any teapot worth it’s weight in gold deserves appreciation. 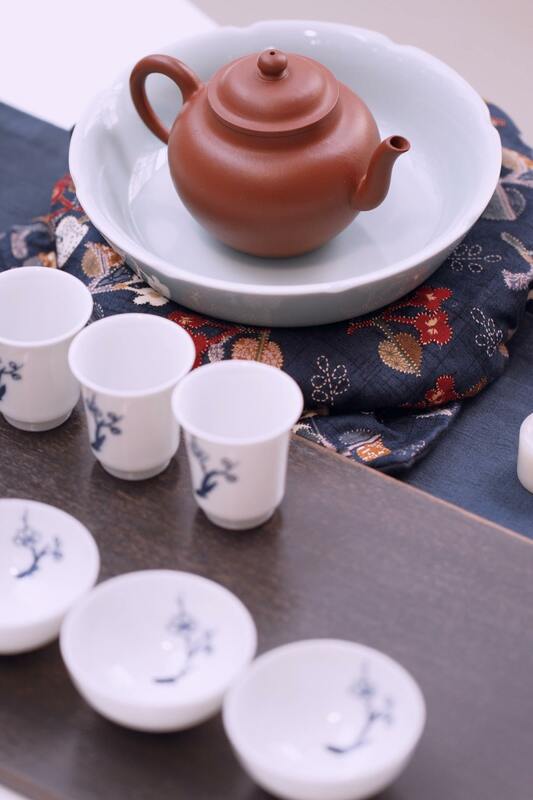 When buying a tea pot one of the most important things is that you feel a personal connection to it. This personal connection makes nourishing the teapot a labour of love. One main reason for nourishing your teapot is that after continual use and time (1+years) the pot will begin to enhance the flavor of every steeping. This is due to the essential oils and resins dormant, deep in the pores of the clay slowly being released. The interaction between an experienced tea pot and the tea you brew inside greatly enhances the overall experience when you use a properly seasoned teapot. What elements are involved in nourishing ones teapot? When you first buy your teapot it will appear dull and lack luster. As time passes with every brew, every hour, every year, the essential tea oils will infuse into the water and clay pot alike. The pot will begin adopt the flavors/essences of the tea. The color of the pot, both inside and out will change. A resin like glaze and shine will begin to appear. This shine is known as Hé Shang Guāng 和尚光 literally meaning “monks shine”. Over time a fragrance will become apparent even when the pot is dry and at rest. While preparing and drinking tea it is normal to pour tea soup over the pot, this is called bathing. The first bathing happens just before the first brew when the tea is being “washed”. After the “wash/rinse” the water is poured out of the pot and into small tea cups to warm them. The tea in those cups is then poured back over the pot. After the rinse any extra discarded tea soup can be poured over your pot during the drinking session, this is called bathing. Some people at the end of a tea brewing session will use a brush and paint the leftover tea soup evenly over the pot and leave to dry, this helps to give the pot an even shine. Also, never wash your teapot with anything but hot water… never use soap or other cleaners. After drinking just leave it to dry. Consistency is important. If you don’t use your teapot often it will not accumulate the treasures of time that enhance the quality of your tea. Consistently using the teapot is only one part, the other is choosing a type of tea that will match that teapot. I use a very general system to match tea and teapot based on the fermentation level or type of tea. For example, I will buy one pot for brewing Pu-er tea, or one for lightly rosted Oolong or heavy fermented Oolongs etc., this is an important part of nourishing your teapot. Perhaps a controversial subject among some tea drinkers. This is because there are two ideas on acquiring the “monks light” of your teapot. One is that the pot should shine from the inside out. This means that brewing your tea and bathing is sufficient and beauty will makes its way from the inside out. The other is that one can freely and gently polish the outside of their teapot with a dedicated tea-towel. The polishing is done when the teapot cool and dry, then one gently and scuffs the outside of the pot. The normal polishing time is under 20 seconds. After the pot has been used and dried off it should be stored in a cool dry place. It should be stored away from other fragrant things. It is easy for the clay pots to pick up the smells of other things such as a moldy closet, incense or the spices in a food cabinet. Do not leave tea steeping in your teapot overnight. Do not leave damp or wet leaves in your teapot overnight. Do not wash/rinse you teapot out with anything but hot water. Do not squeeze tea leaves or rub tea oil over the pot. Do not brew extremely different types of tea in the same pot… It is better to have consistency. Store pots in a cool & dry place away from other smells. These are the very basic ideas behind “nourishing your teapot” and what it means. I tried to keep it as simple as possible. Hope you leaned something! Everything I said above is based on personal experience… if you have anything to add, please do!